With only two weeks left in the school year, the common question at school pick-up these days is, "What are you doing this summer?" Maybe you've mapped out every camp and activity like a boss. Or maybe you've put off your scheduling to the last minute and are starting to panic about how you'll keep your kids busy. And maybe you're looking forward to slowing down and maximizing every moment with your child at home. No matter where you are with your summer planning, one thing is for sure -- Austin, TX is chock full of opportunities for summertime FUN. And we've got a great plan to help you enjoy some happy family time all throughout the summer. 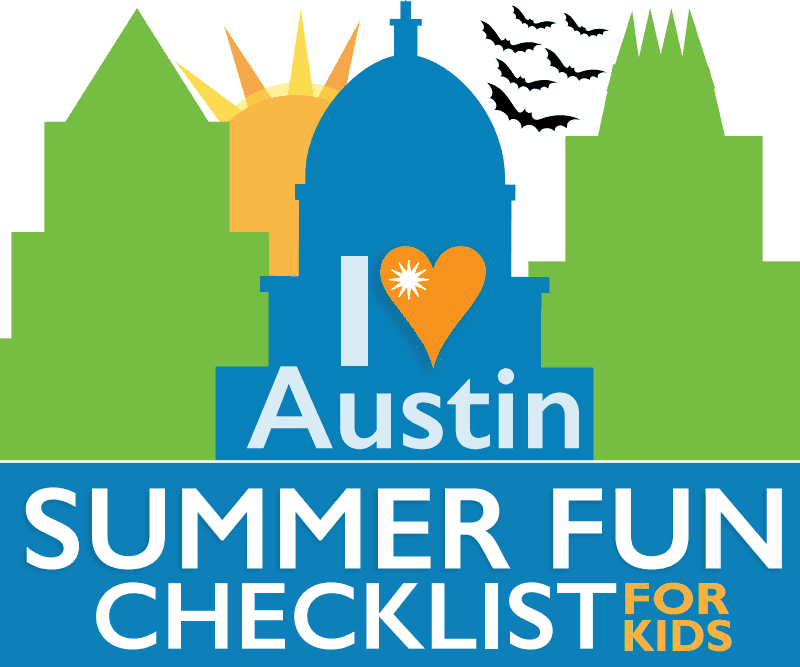 The I Love Austin - Summer Fun Checklist for Kids is a FREE printable that gives 30 suggestions for easy (often free) activities to keep your kids motivated to get out and explore some of the highlights that Austin offers families. And what's even better? Your kids can get free PRIZES for checking things off their list! Free Fun in Austin, LiveMom, Do512Family, and R We There Yet Mom?, 'Round the Rock, and Austin Moms Blog are collaborating to encourage you to get out and go explore Austin with your kids! We love sharing tips and ideas with you, and you can count on us to post more suggested activities all throughout the season. 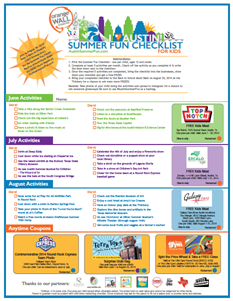 For every 5 activities your child completes from the Summer Fun Checklist for Kids, our amazing prize sponsors -- Top Notch, Zocalo Cafe, Galaxy Cafe, Round Rock Express, Terra Toys, and The Little Gym -- are offering some terrific freebies. Just bring the checklist in and show them what they've been up to. You can read the complete Checklist rules here and instructions here. As you're out on your adventures, you can snap photos of you and your kids enjoying the checklist items and post them to Instagram (#AustinSummerFun) for the chance to win more prizes! Of course, you can keep up with the latest news and giveaway announcements on the Austin Summer Fun website and Facebook page. And as a bonus, we are planning an ultimate Back to School Bash with Austin's most rockin' children's entertainers at the Thinkery on August 20, 2014 to close out your summer with a bang. Austin loves kids. Let's hit the streets give it our love in return. Get out and make this your best summer ever!